Paxi, Paxoi, Ionian Islands, Τουρισμός, Διακοπές στην Ελλάδα. Paxi could very well be considered the ultimate Greek island. It may not even be the best in any single respect, but still, combine all the factors and you get a pretty terrific package. The island is small, cozy and green. Very pretty to look at. It's small villages are about as picturesque as it is possible to get. The main town of Gaios (in the south east) set in a gorgeous deep bay, the very small and friendly Loggos (in the north east) and the picture perfect Lakka (in the north). Paxos is literally covered with olive trees – a legacy of the Venetians who introduced them over 300 years ago – and olive cultivation remains, with summer tourism, the island’s main form of income. Every family owns olive trees, and the oil so-produced is amongst the best you can find. Pines and cypresses also flourish, and lead down to the water’s edge. Despite its size there are over 30 beaches to choose from. Most are small and of gleaming white pebbles which shelve gently into crystalline waters. Some can only be reached by small motorboat, by far the best way to explore your local coastline. Should you hanker after sand, you have only to visit tiny Anti-Paxos a mile to the south, which has some fabulous sandy beaches and Caribbean-hued waters. Due to the open sea here you are not allowed to take a hire-boat over, but there are plenty of small excursion boats which will take you. 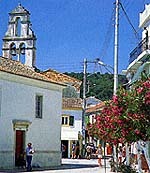 The population of Paxos is about 2,400. 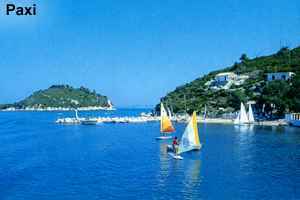 Most live in the three main seaside villages of Lakka, Loggos and Gaios, the capital. All have their own distinct character and charm. Lakka is at the head of a wide bay and faces Corfu. Sleepy Loggos is the smallest and prettiest of the three, with about 30 old houses clustered around the waterfront. Loggos has some excellent tavernas, a bakery and a few small shops. The nearest beach is a five minute walk around the headland. Gaios is the capital. Although not large, it is bigger than the others and the most cosmopolitan. Popular with the yacht fraternity, it has an attractive flag-stoned square, plenty of cafιs, a number of small bars, and a good choice of restaurants. The view of Gaios’ pretty waterfront buildings from the island of Aghios Nikolaos across the narrow channel is little changed since Lear painted it in the 19th century. >> Ionian Islands : Corfu, Ithaca, Kefalonia, Kythira, Lefkada, Meganisi, Paxoi, Zakynthos. Holidays in Greece, Travel Greece, Greek Islands, Greece Hotels. Welcome to Hellas (Greece) and welcome to Hydra! it's probably impossible to fit all of Hydra's fascinating beauty in this small pamphlet. We have attempted, however, to give a short description of the island that has enough to offer the visitor and guarantees a memorable vacation. The healthy dry climate, the friendly people, the sparkling warm waters and the picturesque harbor that at sundown transforms into a cosmopolitan city full of sports, scuba diving, trips to the islander historical monasteries, donkey rides in town, shopping In the stores along the harbor, good food in the taverner and restaurants, and all night partying at the bars and music clubs around town. The high quality and exquisite service characteristic of the hotels and other shops and restaurants fit perfectly the strict standards of the highest class visitors and the jet set from all over the world that come to Hydra every year.